Before I begin this post, I want to make a little announcement. A while back Eric, one of the loyal readers, asked me for recipes that feed one to two people. When I cook, I have a tendency to make quiet a bit of food leaving us with some leftovers for a couple of days. However, after our conversation I realized that he does have a point and that I should be more conscious about posting small batch recipes. I will try my hardest to post as many recipes possible under a brand new category: Meals for Two. With this said, remember that if you want to make this dish for more than 2-3 people all you have to do is double the ingredients. One of my favorite khoreshts that I remember my grandma making is Khoreshteh Kadoo with Gooreh, unripe grapes. To this day it is still one of my favorite khoreshts. Unfortunately, I don’t have any gooreh, so I used Limoo Amani. Alternatively, you can also use lemon juice. 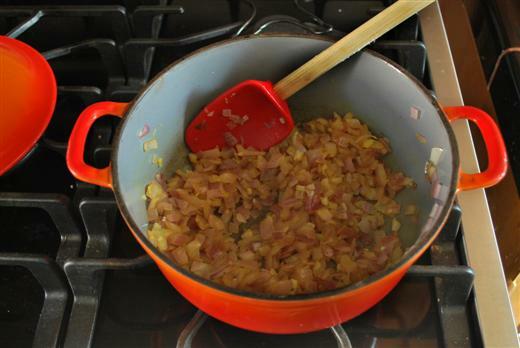 Sauté onion and garlic until translucent. Add turmeric give it a stir. Add meat and let brown on all sides. Crush Persian Lime and add to pot. Season with salt and pepper. 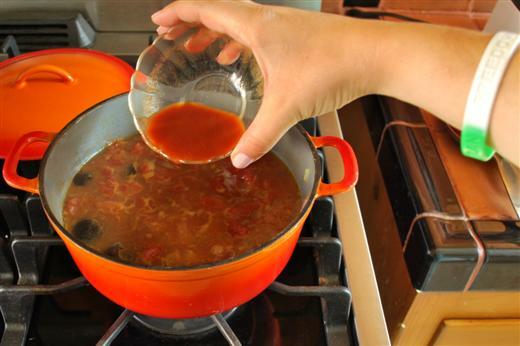 Add 1/2 cup of water to the empty can and pour water in the pot. Cover and bring the juices to a boil. 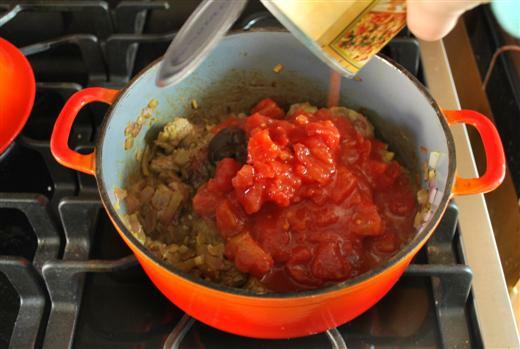 Place tomato paste in a small bowl. Add 3 tablespoons of the juices and mix well. Pour the tomato paste in the pot. Cover and cook for 1 and half hour, until the meat is nice and tender. 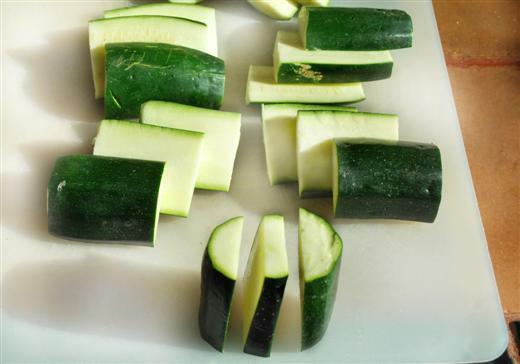 In the mean time cut the zucchini in three sections. Then cut length wise in three more sections. 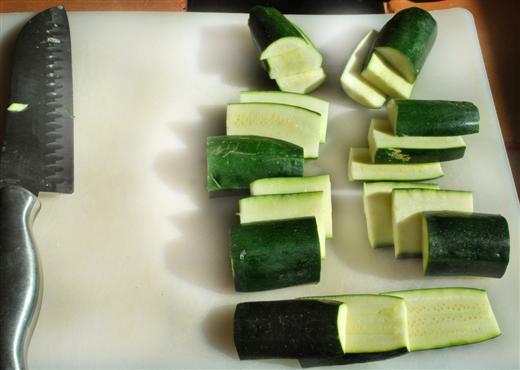 Here is a close up of the cut zucchini. 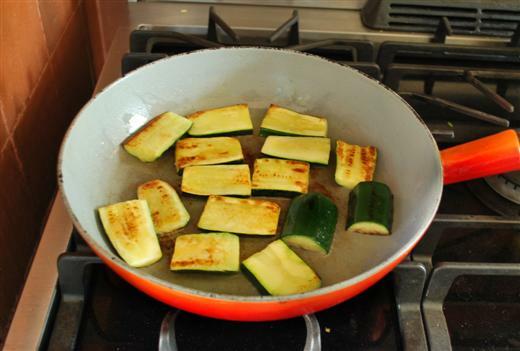 Warm up a bit of vegetable oil in a skillet and lightly fry the zucchini. They don’t need to cook all the way through, they just need to get slightly golden. Fry in batches without crowding the pieces. 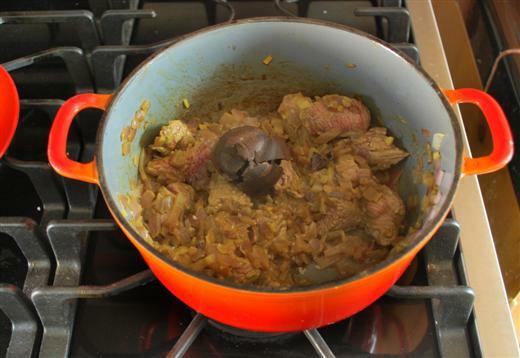 Add advieh to the stew. Mix well. Adjust seasoning if needed. Place the fried zucchini on top. 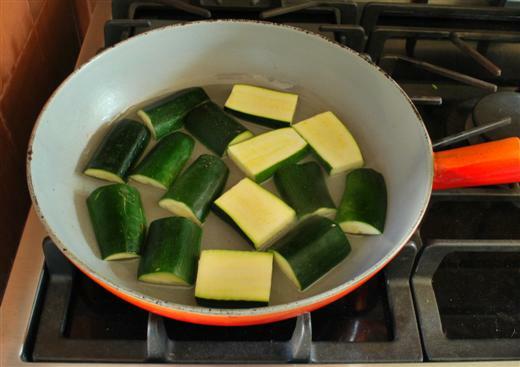 Gently pour some of the juices on top of the zucchini. Cook covered for 45 minutes to 1 hour longer on medium low. 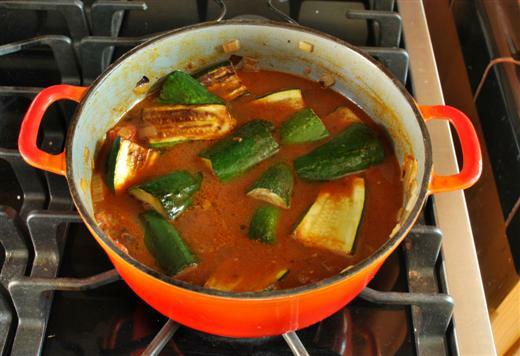 Do not at any point stir the stew, just leave it alone as you don’t want the zucchini to fall apart while stirring. 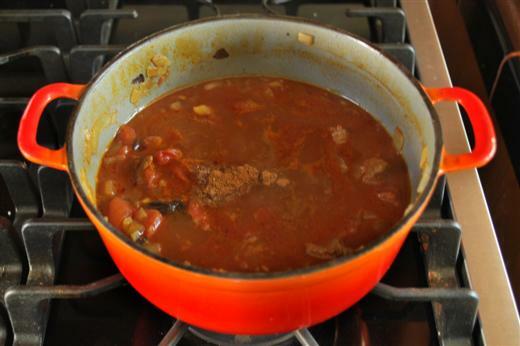 If there is too much liquid cook with the lid slightly open for about half hour of the cooking process. I am going to try this. Thank you very much. One question. Is advieh the same as cinnamon? There is cinnamon in advieh, but there are other spices as well. You can find a recipe for it at the following link: http://mypersiankitchen.com/?p=228. Good luck cooking! Let me know how it all went! love khoresh-e kadoo, or anything that has kadoo in it. looks very delicious. I like the step by step photos. Thank you Azita Jan! I feel the same way about kadoo! Thank you for a great dish…I love Kadoo! I can even smell the food through my computer fan! I am a lazy student and don’t have much time to cook. Is there a Persian dish that can be made in less than 15 minutes? aaww Hungry Tiger! I love it when you leave comments. Why of course there is a dish that is made under 15 minutes: Must-o-khiar!!! for khoresht kadoo, it’s better to use the Mexican zucchini, the one with a lot lighter green color ,pill them , cut them vertically and fry them lightly as you said. For the spice for this khorest you can use ” Ab Ghore” (unripe grape juice) towards the end and also add some ghore ( unripe grapes) to give it a sour taste . Try this recipe too and you will love it. Have fun, and take care. Hmm I never thought of using Mexican zucchini as they seem to fall apart more than regular zucchini do. I keep on forgetting to check for ab ghooreh at my local Persian store. Indeed, it is so much better with ghooreh or ab ghoores as that’s what my grandma always used. Hello Persian Cook! I love your site! My fiance are the reverse of you and your husband- I am American, he is Persian/ grew up in Iran. I LOOOOOOVE the food his mother cooks when we visit, and I am trying to learn the techniques. Its great to have a great website to consult when Maman is not available! Merci! Ansa, thank you for your kind words. I hope you will make plenty of delicious Persian dishes from now on! Your Khoreshte Kadoo looks amazing. I have bookmarked your site for future tasty reading! Looks delicious! I was always taught Kadoo was pumpkin, so khorest-e kadoo meant something else to me. But my Farsi vocabulary is equal to that of a 5-year-old! I will have to try this one. Lately we’ve been doing khoreste bamia or ghormeh sabzi, but this is a great time of year to use zuchinis and squashes. Thanks! 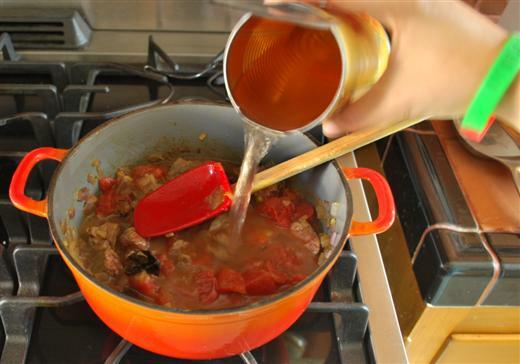 “Place tomato paste in a small bowl. Add 3 tablespoons of the juices and mix well.” Sorry, I’m confused. I didn’t see ‘juice’ in the ingredients list. Does this mean the lemon juice mentioned in the description? Anahita, what I meant was the juices/liquid from inside the pot. I hope this helps! I just wanted to thank you again for these delicious recepies. MY persian cooking has really improved since I found this website! Hello Pardis, thank you for your kind comment and I am glad I can be of help in your kitchen adventures!! hi does that mean in all two and a half hours cooking from start to finish? And could you tell me exactly whats in advie (spices)? Is it Turmeric & Cinnamon only?) Also do you have any recipies that include Spinach that has to be eaten with Bread or Rice on your site I would be very grateful! Chef, We made your koresht kadoo today and loved it! The instructions and photos at the appropriate steps helped us a lot. We bought a Persian rice cooker last year and have successfully mastered it. However, we have tried multiple koresht recipes from cookbooks and could never get that authentic flavor we adore from the restaurants. Your koresht kadoo is the first koresht we’ve made that tastes as good as the restaurants! Thank you so much. We have 2 requests if you please. 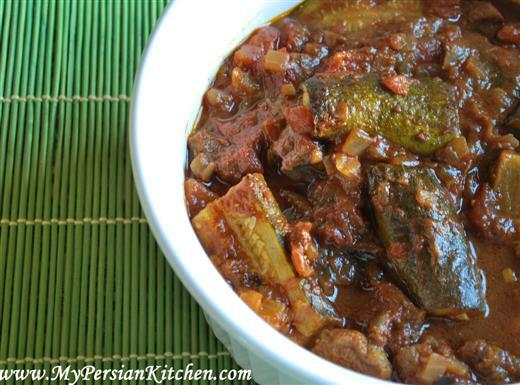 My husband and I enjoy Gheymeh Bademjon stew and Vegetarian Persian Stew. Would love to try your versions as we have yet to find a version we adore. Thank you! Michelle, so glad that you made my recipe and liked it!! I will definitely put your requests on my list! I am American and my husband if first generation Iranian. We lived with his mother, grandmother and grandfather so Persian cooking was an everyday experience. I have kept the tradition for my children. I tried the Koresht Kadoo recipes. We love it! We use chicken instead of beef or lamb. Any suggestions on cooking time with chicken? Also, how much lemon omani would I use in place of dried lime? Thank you! Robyn, I would reduce the time by half for chicken as it cooks much faster than beef. Also dried limes are limoo amani!!! Oh my god lady I think you just saved my life 😀 I’ve been living on my own for about 2 years now and I can’t eat anything other than Persian food (I’m just pampered like that haha), and since then I’ve been making up my own recipes until I found this site. Now I can finally make some real Persian food from some real recipe <3 You are awesome. Thanks a bunch. Nadi Joon, so glad I can be of help!! I have followed your recipe, but isn’t look like you did. @Ashkan, how does it look? Thank you so much. This recipe turned out delicious! The pictures really helped. Also, the more commercially available dried lemon peel can stand in for Persian lime if you don’t have a middle eastern market near you! Salam tashakor mikonam az zahamattan.mamnon misham tarjome farcy sham bezarid.ba sepas. The pictures really help. dastet dard nakoneh! If I am using gooreh instead of Persian limes do I add them at the same time as directed in this recipe or later and is there anything special to prepare them for cooking other than rinsing them? Lauren, yes, you add them at the same time! 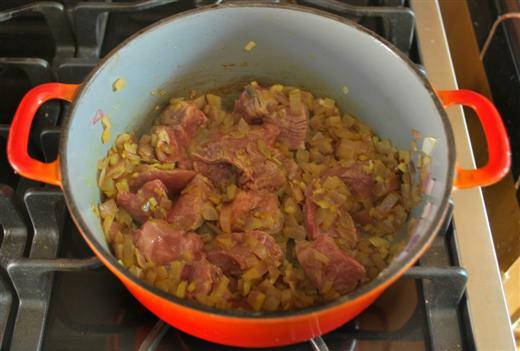 Because I didnt have enough beef, I added some cauliflower to it – was good! Hello Persian Kitchen lady! I know this is a very old post but I just wanted to say how much I enjoy your site. I’m from Seattle and I just found dried Persian limes at a market. They smell so good and I am excited to try out your Khoresht-e kadoo tonight. I’m fascinated by your language and food and I hope to be able to visit Iran someday. Mersi! Ruz-e khubi dashteh bashid!